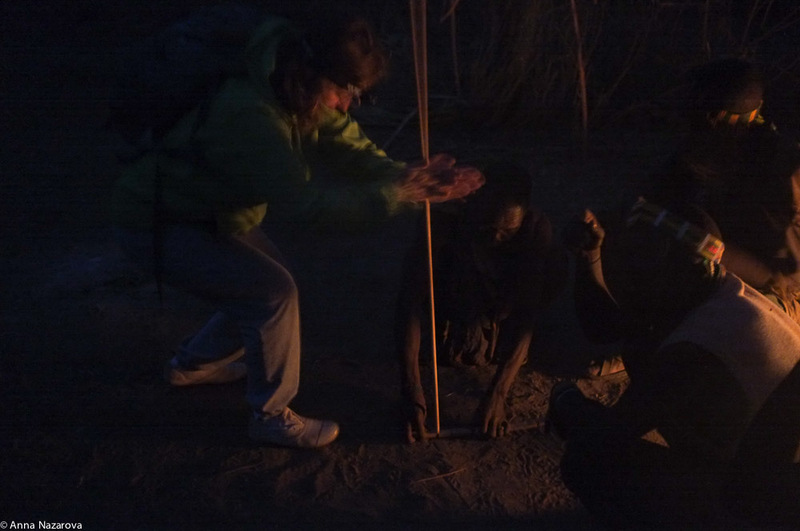 On our last day in the early morning we woke up at 4 am and headed to visit Hadza people. Since these people are hunters-gatherers, we visited their village to share a hunting experience with them. They hunt every day or two, depending on how lucky was their last attempt. Since they don’t stay long at one place, they don’t have any facilities at all to store food, they eat what they can catch and then they hunt again. They don’t grow anything, but only gather some plants in the bush around. 1. 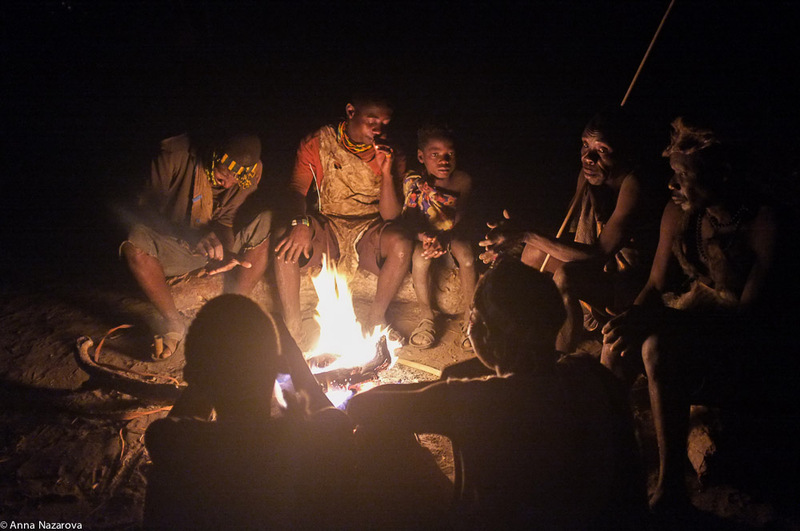 When we arrived it was still dark and the men of the Hadza family were sitting around the fireplace and smoking marijuana. As they explained to us, it was sort of a ritual to get stronger and fearless before hunting. 2. They produce fire with an old fashioned manner. Of course, I couldnt resist to try it on my own. It was pretty hard i’d say, you should move your arms very fast! In the afternoon of Day 9 of our amazing journey, we headed to visit Datooga people. Well, what can I say? It’s one of the most exiting experience ever to meet people who live far away from the “civilization”, it’s like traveling back in time! They don’t update their Facebook and Twitter every five minutes, they don’t have any modern facilities in their houses, their everyday life is simple is that. They produce handmade leather clothes and jewelry using spoons and other metal stuff they can get. And they also produce some arrowheads for Hadza people. Their kids go to village school, but not all of them stay there for long time. Yes, they sort of entertain tourists. But being there and seen what i’ve seen makes me sure that its not just a theatre for tourists. The surrounding territory is a typical african bush with lots of wildlife around and nothing more. Few villages are thrown out here and there with one tiny local shop. And that’s basically it. The main food there is Ugali, kind of a porridge made from corn flour. I didn’t have any impression that after we left, they immediately switch from their dirt houses to some other more modern ones. In this post i’ll show you some photos and videos from our visit. After visiting the Ngorongoro crater area, we continued with one of the most memorable places ever Lake Eyasi. Not so many safari operators offer this opportunity to visit this remote area and take a look at the tribes who live there: Datooga and Hadzabe. We not only visited their villages but also had a unique chance to see how Datooga tribe people make hunting weapons for Hadzabe tribe. And on the next morning we could even hunt for about 3 hours with Hadzabe people. That was simply amazing! If you ever have a chance to visit Tanzania, this is definitely one of the places I can strongly recommend. In this post i’ll show you some general photos of the camp we lived and lake itself. Next two posts will be about Datooga and Hadzabe people. I didn’t use my canon camera during those two days, only iPhone and Fuji, since it was much easier, especially when you run through the bush to catch a small bird. 1. 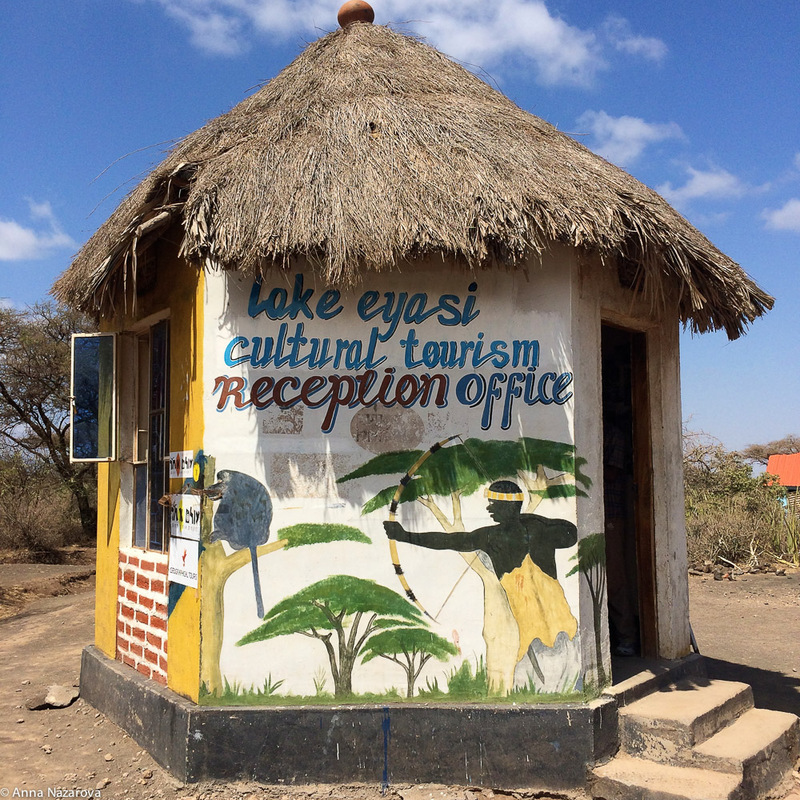 This is the reception office of the lake Eyasi area where they give you a guide and you pay some entrance fee. (everything was already included in the price of Bobby Camping safari).